The area still has traces of the days when it was one of the greatest cotton producers in the world, but today it relies on the tourist industry by attracting large crowds to its grandiose folk celebrations. The Festa do Bode is a traditional event which takes place in the municipality of Cabaceiras; here you can also find the intriguing rock formations and drawings of the Lajedo de Pai Mateus. There are two other pre-historic treasures in the interior: the Inga archeological site, with its millennia-old inscriptions, and the Vale dos Dinossauros (Dinosaur Valley), in the village of Sousa. One of the longest sections of dinosaur tracks was discovered in the village. Tiny Areia, on top of the Serra de Borborema range, is another historical must-see: Iphan declared this 19th -century town a National Heritage Site in 2005. Sitting in the Serra da Borborema range, 125 kilometers (78 miles) west of João Pessoa, Campina Grande can be reached from the BR-232 highway. Founded in 1790 under the name Vila Nova da Rainha, Campina Grande took on its current name in 1864 when it officially became a city. Its brief moment of glory came in the mid-19th century, when the Civil War interrupted cotton production in the United States. That event elevated Brazil to the position of second major cotton producer in the world (England's Liverpool-based industry took first place). Alongside its historical traditions, the city zealously maintains its culture of music and folk festivals: this is the home of the original forró, called pé-de-serra – a dance accompanied by the triangle, zabumba drum, and accordion. The city's São João festivities are the most visited celebrations in the country. In June, approximately one million people show up for the festivities. On the night of June 23rd alone, the Parque do Povo - an enormous building in the center of the city that houses several artisans' stalls – admits 80,000 people to see quadrilha (quadrille) square-dances. Dancers perform about 300 such dances over the course of the month. In June and July, the fun extends during the weekend to the Trem Ferroviario, a train that brings a "traveling dance" to the district of Galante, 12 kilometers (7 miles) away. Each of the seven seat-less carriages has a trio of musicians. The forró train departs from the railroad station at 10am (Praҫa Coronel Antonio Pessoa, 124). The Parque do Povo in Campina Grande also holds the Micarande, the very popular out-of season Carnival celebration in April. The Museu do Algodão, located in the old railroad station, keeps alive the memory of the time when cotton (known as "white gold ") was the foundation of Campina Grande's economy. The Museum's collection includes apparatus – mostly rudimentary pieces made of wood - utensils, and photographs, as well as an authentic cotton bale weighing 100 kilos (220 pounds). Rua Benjamin Constant, Largo da Estaҫão Velha. This building, from 1814, originally housed the city council and prison. Here, the government held captive the Carmelite friar Frei Caneca for his role in the Confederation of the Equator uprising. In 1897 the building held the Telagraph Company - the faҫade's inscription still reads "Telegrafo Nacional" (National Telegraph). The Museu Historico de Campina Grande occupies the ground floor, featuring a collection of maps, photographs, and notes explaining the local history stretching from the first Indian villages, through to the sugarcane and cotton booms. Rua Marechal Floriano Peixoto, 825. Founded in 1967 and run by the State University of Paraiba, the Museu de Arte Assis Chateaubriand has an important collection of 560 works, including paintings by artists Di Cavalcanti , Lasar Segall, and Tomie Ohtake. The collection, however, has currently been relocated; the museum features just one gallery of 54 works, but with canvasses by Brazilian painters Pedro Americo and Candido Portinari, the visit is still worthwhile. Guided tours are available. Rua Marechal Floriano Peixoto, 718, Centro. The quiet streets and simple, old houses of Cabaceiras served as the setting for the films The Dog's Will (O autor de Compadecida; 2000) by Guel Arraes and Cinema, Aspirins and Vultures (Cinema, Aspirinas e Urubus; 2005) by Marcelo Gomes. Far away from the big screen, Cabaceiras, 69 kilometers (43 miles) southwest of Campina Grande and 193 kilometers (120 miles) southwest of João Pessoa, is the stage for the traditional Festa do Bode (Goat Fair). The fair takes place at the end of May and lasts for three days, completely occupying the town's interest for the duration. Here they sell or exchange the best-looking and fittest animals, buy and sell the latest goatskin items, and choose the year's "Goat King". The local reverence for this animal is well justified: tucked away in the semi-arid area known as Sertão do Cariri, Cabaceiras relies on goat breeding for economic survival. But life's not all about goats: with musical performances and other attractions, the fair also attracts those who are just looking for fun. The biggest attraction is a trip to the magnificent Lajedo de Pai Mateus, a huge flat granite formation – far bigger than a soccer field – peppered with enormous boulders. According to legend, the faith healer who gave his name to the place lived here in the 18th century, under the helmet-shaped boulder called Pedra do Capacete. The lajedo is located on property that belongs to Crysostomo Lucena de Almeida. If you wish to visit the area, ask his relative, Lucena de Almeida, for permission. It is easy to get lost among the stones, so be sure to ask Mrs. Almeida for a guide. The sun can be relentless on the flat granite - take a hat and water for protection. Since June 2004, more than 18,000 hectares (44,500 acres) of the region that includes Lajedo de Pai Mateus have come together to form the Cariri Area of Environmental Protection. Approaching the city from João Pessoa, take the BR-230 highway west to Campina Grande, then follow the PB-148 state highway south, toward Queimadas. Be doubly careful on the winding road from Bogueirão. The Sitio Arqueológico makes this small town famous beyond the limits of Paraiba. The archeological site contains the Pedra de Ingá, also known as Itacoatiara de lngá ("itacoatiara" means "stone inscriptions" in Tupi-Guarani). This 24-meter (79-feet)-long and 3.8-meter (12.5-foot) -high stone contains inscriptions that specialists figure may have been made 25,000 years ago, probably by groups who worshipped water. Tourists from all over the world visit the site. It escapes neglect thanks to the efforts of Cecilia and Renato Alves da Silva, a local couple who receive no compensation for looking after this natural monument - it's "a labor of love". The famous ltacoatiara is accessible through the house that serves as an "archeological museum", with illustrations and maps. Ingá is 109 kilometers (68 miles) southwest of João Pessoa, along the BR-230 highway. Sítio Arqueológico de Ingá. Tiny, enchanting Areia lacks good accommodations, but it is worth a visit, especially for anyone already in Campina Grande. Perched at the top of the Serra da Borborema range, the town is 49 kilometers (30 miles) northeast of Campina Grande and 130 kilometers (81 miles) west of João Pessoa on the BR-230 highway. 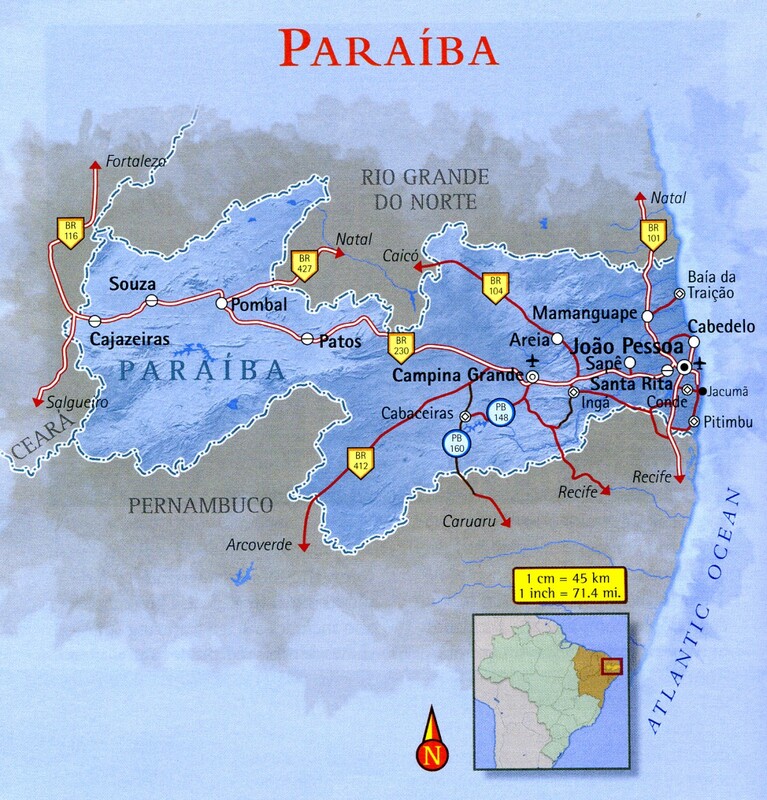 Sugarcane plantations surrounded the town of Areia, since sugarcane used to thrive in its damp soil. Economic prosperity produced an intellectual, liberal elite, who became responsible for the lovely architecture that Iphan protects today. The same elite financed the building of the Teatro Minerva (Rua Epitácio Pessoa, 102) in 1859, which became the first theater in Paraiba. The Minerva, originally known as Recreio Dramático, owes its current name to the statue of the Roman goddess who stands atop the frontispiece. The small, gable-roofed theater stages plays by the town's drama groups. Novelist and politician José Americo de Almeida (1887-1980) was born in Areia, as was Pedro Américo (1843-1905), one of the most important 19th -century Brazilian painters. Known for the painting Independencia ou Morte (Independence or Death), among others, Americo's work is featured in the Paulista Museum (also called the lpiranga Museum) in São Paulo. At only nine years of age, Américo left Areia to draw for an expedition, led by a French naturalist, that traveled around the Northeast. His former house is known as Museu Pedro Américo (Rua Pedro Américo), and even though it does not contain any original works by the artist (just black-and-white copies), art students often come here. Many visitors enjoy the Museu do Brejo Paraibano, also known as the Museu da Cachaҫa e da Rapadura (Universidade Federal da Paraíba, Campus II, Areia). This Várzea sugarcane plantation casa-grande (master's big house) has a collection of furniture, utensils, and other items from the sugar boom. Located on the Areia campus of the Federal University of Paraíba and built around 1870, it is a typical Paraiba plantation - solid, simple, without ostentation, and very different from the luxurious constructions in other northeastern states. Sousa's 51 dinosaur footprints, spread out over 50 meters (164 feet) are among the world's longest stretches of dinosaur tracks. The footprints line the bottom of the Peixe River Valley, fittingly known as Vale dos Dinossauros (Dinosaur Valley). The passageway known as the Passagem das Pedras contains nine tracks, and the museum helps visitors understand the immense importance of this natural treasure. Try to visit the valley during the dry season, between July and December, when it's easiest to explore the Peixe River basin within two days. Visits must be arranged in advance. 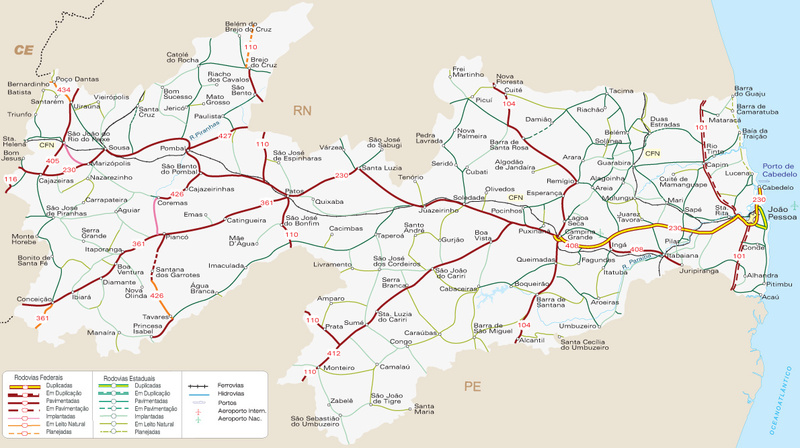 The tracks are just off the road to Uiraúna, 8 kilometers (5 miles) from Sousa. When visiting Sousa, you can also buy hand-made hammocks and bedcovers, which stores all over town sell. Sousa is located 436 kilometers (271 miles) west of João Pessoa along the BR-230 highway.